I'll be attending Symposium's HR and Brexit summit on Thursday (5th July 2018) next week. They've put together a great list of speakers, and if you're able to, you should come. There are lots of big issues for us to consider so I don't expect the event will be overly political. I also don't intend to make my more posting political either, but part of the reason I set up my blog 11 years ago was that I felt I'd colluded (in a very small way) with the broader dysfunctional behaviours in financial services that took us into the 2007 crash, and I wanted to be more open about my beliefs. 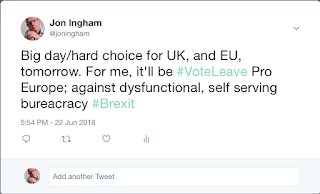 In addition, Brexit is an issue that it's hard not to be at least partly political about - eg economic forecasts depend upon what assumptions you choose to make about the future, which will themselves depend upon your politics. I'm also not sure I'll be able to post from a conference on Brexit without being fairly clear about my beliefs around the topic. I voted leave. And I still support that decision. 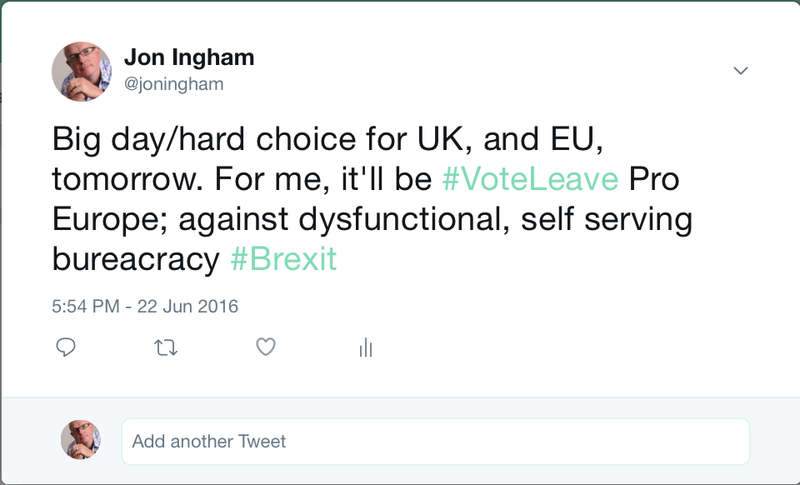 As I tweeted at the time, the EU is dysfunctional, self serving and overly bureaucratic, and we'll be best off outside it. This dysfunction and self serving is shown was shown best in the Greek financial crisis where the EU cracked down on the Greek people rather than supporting them. That is, it was more concerned about itself rather than the population it is supposed to be serving. However the issue came to the fore as far as the UK is concerned when David Cameron tried to negotiate some tailored approaches which better suited the UK. Once again the EU showed it was more concerned about itself than our population. One of these areas was immigration. I don't think that this was the issue that led to Brexit but it's clearly a particularly significant challenge for the UK given the small size of the British isles (particularly the sunny bits where most people want to live) and the fact that so many people speak English, and know they can come and live in the UK. That's got nothing to do with any individual who has or wants to come and live here but just recognises the strain which a huge rate of population growth has put on housing, transportation, health and many other areas. An effective and representative government would have recognised these factors and should have wanted to do something about them. Instead, the EU basically said no. I voted leave mainly on an organisation design perspective - if the EU was a client I'd tell them their top level structure wasn't effective or sustainable and needed to be sorted out. The UK government isn't perfect either and once we've sorted out Brexit I'd like to see us taking action about our head of state (moving from being a monarchy to something closer to a republic) and the house of lords as well. But at least these issues are within our own control to change. I also think it's important to take action on issues rather than to let them fester because they're too difficult to be dealt with. For example, if someone is living in a bad marriage, and they have tried to improve it, and it's still dysfunctional, I believe that in most cases, they should get out, rather than stay in it for the sake of the kids. This may not be the ideal time to exit the EU, but there never will be an ideal time. If we can't tackle the issue now we never will and we'll be tied to an ineffective supernational government for ever. We needed to bite the bullet and have the issue resolved now. The withdrawal process since the referendum clearly hasn't gone that well, but at least a significant part of that has been down to the EU being the EU, more interested in protecting itself than supporting a member country and its population that has already paid nearly £200 billion net to the EU over the last 45 years. We deserve better, but the EU was never going to deliver it. The difficulties we've experienced in the negotiations are the same ones which lie behind us leaving. And whatever difficulties we face in leaving the EU, these will be balanced longer-term by having a government that works for us, rather than for itself. This has got nothing to do with our attitudes to Europe. We're in Europe, want to be in Europe, and will always be in Europe. We want as close a connection with other European countries as we can have. We just don't want to be governed by the dysfunctional bureaucratic machinery other countries seem prepared to accept. That leaves the issue of the single market and customs union. I think we should be leaving these too. We don't want to be in the EU but we don't want to be shadowing the EU in something which is like the EU but not quite as good. That means we need to be able to do our own thing, including to strike our own trade deals, which means we need to be out of the whole enterprise. My hope therefore is that the UK cabinet's meeting at Chequers on Friday continues to push for a relatively hard Brexit, and to retain the option of a no deal if the EU doesn't want to negotiate appropriately, which should include reviewing what monies we owe in our separation agreement. Importantly, all of this needs to be dealt with now, rather than left over to the transition period. I also hope HR focuses on the opportunities of Brexit. -The fairly limitless supply of cheap and well qualified labour from the rest of Europe and elsewhere has, I think, meant that firms here haven't invested in their people or their people supply chains in the way they should have. We've now got no choice, we do need to invest, rapidly, smartly and creatively. Or we won't have all the people we need. That's going to be hugely challenging but it will still basically be a good thing to happen to us. I look forward to more, and I hope you'll follow my blog posts and tweets, next Thursday. I'll be writing them as apolitically as I can manage! 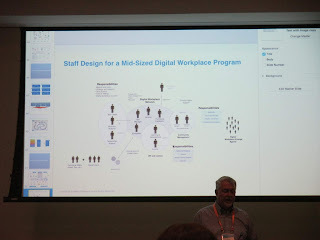 I'd seen Tony Byrne from Real Story Group present at an Enterprise 2.0 conference in Santa Clara eight years ago (this was my presentation there) and remember it was an excellent session so I was really looking forward to an update at Digital Workplace Experience in Chicago. 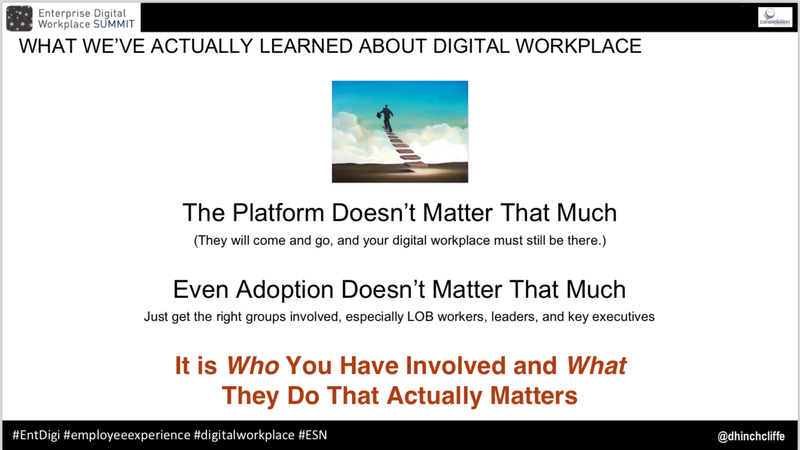 Especially as Dion Hinchcliffe talked about the accidental digital workplace canvas no longer being sustainable. 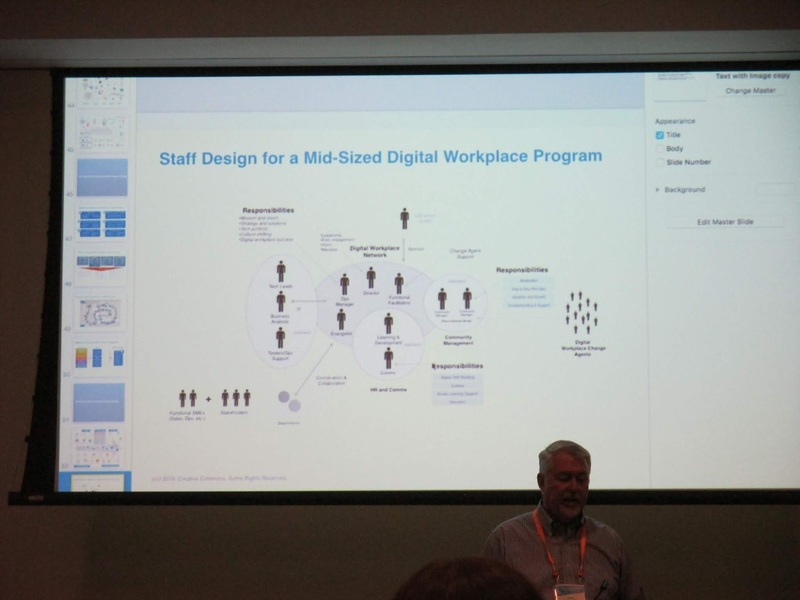 For Tony, the future digital workplace will probably consist of major platforms supplemented with best of breed point solutions. I agree, though for me, this is about the limitations of cloud. Ie that now so much of our technology is only open to configuration rather than customisation it can constrain our needs for best fit. The optimal solution is therefore often best practice cloud for the bulk of our functionality, and best of breed solutions for the things which really matter for us and for which we therefore need best fit. 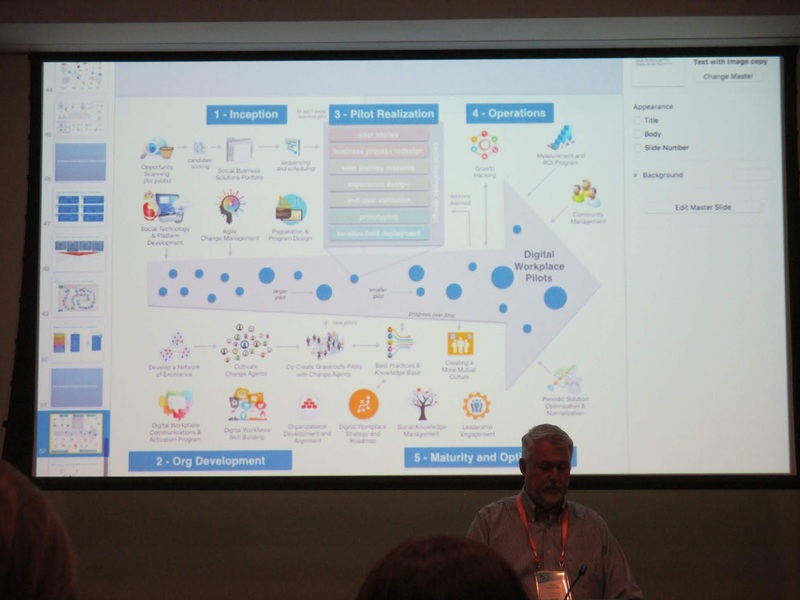 Tony suggested that fit in this context needs to include scenario fit, technology fit, vendor fit and value fit. I also liked Tony's mall metaphor, where there are anchor stores includes the capabilities which are critical for employees such as collaboration, the enterprise social network and HR, and then additional boutiques. If one boutique goes down the mall doesn't change. If an anchor store does the mall is in trouble. This means we need to be smarter about our technology selection decisions, understanding how we can help employees work better through design thinking and the use of personas, journey mapping and top tasks analysis, etc, as well as employee stories illustrating these employee journeys or use cases. 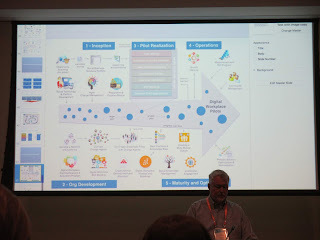 We also need to put more focus on applications rather than sites or content, eg by thinking more deeply about the specific functions a particular system can provide, rather than assuming that because we can use something for x, we can use it for y - with Office 365 providing a good example of this. I particularly liked Tony's arc of participation model linking features to outcomes. Which of these will move the needle often depends on the employee journey. I particularly liked this model as I think the horizontal scale maps to the work done by people (eg collaboration) - people doing work (eg networking) scale in my own categorisation model. 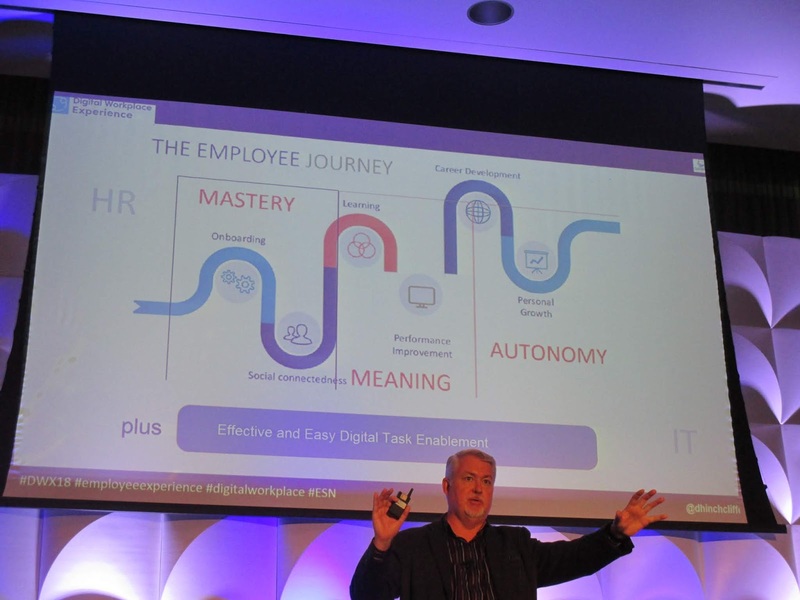 I've seen Dion Hinchliffe present four times over the last week weeks - at London's Enterprise Digital and then Chicago's Digital Workplace Experience - all great, insight-ful sessions. Here are some notes and reflections - keep in mind that these come from four sessions, so please forgive the length of the post! 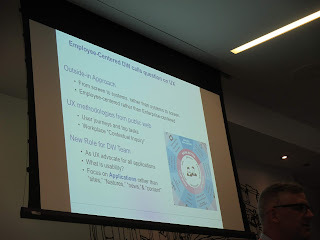 One interesting point was an acknowledgement that IT tends to be in charge of digital but is least prepared to deal with the core aspect of all of this which is the people side, especially in the digital workplace's collaboration systems. Which is why I suggest HR needs to take a leading role in digital transformation. However, Dion also suggested that the social organisation is great but digital has to be about business outcomes and how work gets done as this designs adoption in from the start. Which I disagree on - focusing on lead outcomes vs just lag impacts provide a much greater basis for adding and creating value. 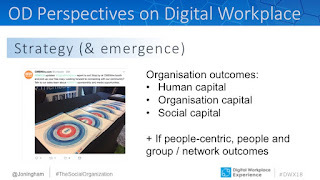 The Social Organization is a core opportunity to create a digital workplace. The platform doesn't matter that much. We have over-invested in technology which tends to become a religion. And makes it likely that we have not been designing for the employee experience. If you are implementing ERP or CRM solution you get 100% adoption from day 1. This does not happen with the digital workplace - you need usability too. And even adoption doesn't matter that much. Any good HR officer will say 10% of the organisation delivers 90% of the benefits. Many of them do, but it's nonsense. Or if it's the case, you've got a rubbish organisation design and your organisation need to be 10% of the size and use a lot more outsourcing. 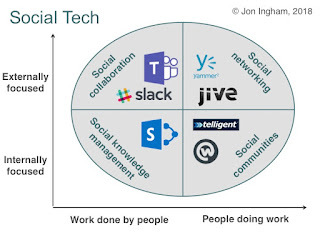 But it is generally nonsense, and misses the role of social talent who help other people contribute, as well as the importance of the overall social fabric of the organisation which is so central to digital business. It is who you have involved and what they do that matters. We try and do everything ourselves vs letting the network do the work. Yes, we need to be much better at using networks, and yes, a small number of people can be particularly significant within a network (eg Innovisor's 3% rule). But that still doesn't mean you only want 3 or 10% of people to adopt your digital platform. Workforce engagement is the real opportunity and there is lots of evidence that technology can improve engagement. Key opportunities include getting paid, industrial scale manageability, a great environment, voice, and autonomy. 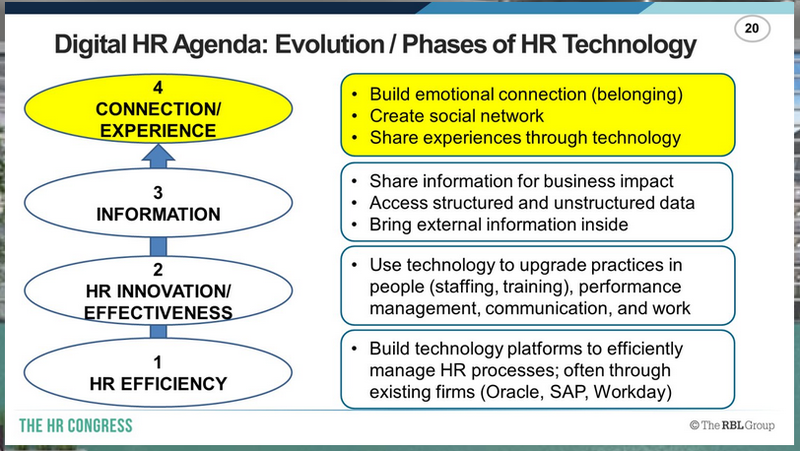 However, organisations tend to focus on the technology rather than focusing on the harder factors - people, culture etc. We've learned that putting employee experience at the centre leads to success. 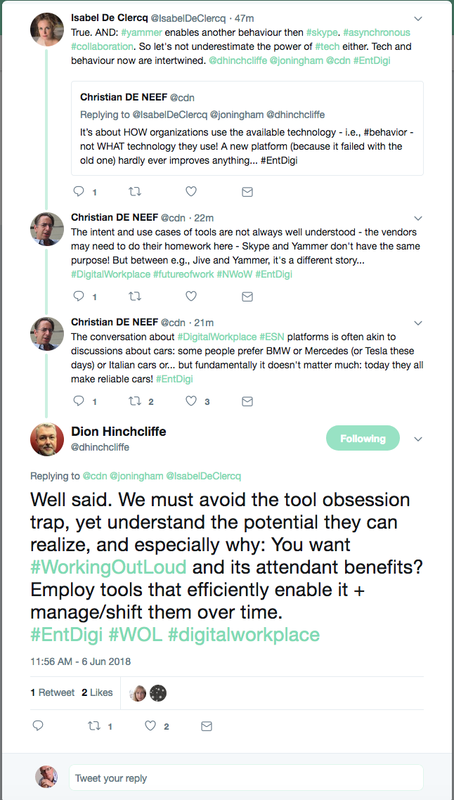 For example Bosch have totally overhauled 25 core business practices around social networks, providing a 25% time saving. I also liked Dion's example from Accenture where the CEO sees his main job as enabling the top 100 moments for 500 thousand workers by providing light weight experiences for them. 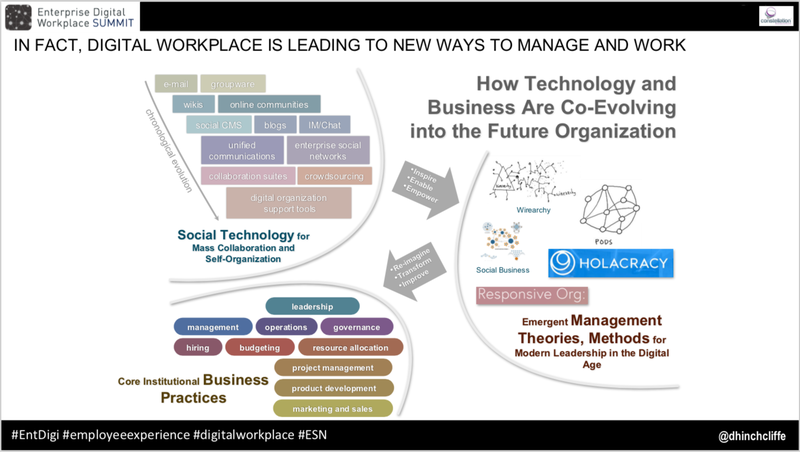 With this perspective, the digital workplace is leading to new ways to manage and work, such as Holocracy (although hopefully not this itself, as I explained in my own session). Organisations are also starting to use communities and networks rather than centres of excellence to break down silos (in The Social organization, I call these communities and networks of performance). Eg centres of excellence tend to get bogged down after about a year. 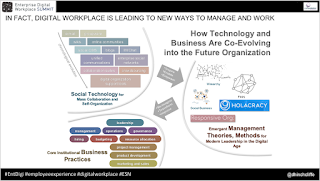 Communities and networks can take a new thing, eg collaboration, analytics, etc, and bring together relevant experts to provide a highly concentrated set of capabilities and make the organisation go faster. They can then capture what's been learnt and spread more broadly through resources, frameworks, etc. These are better than the project model for many different things. Over time, these capabilities can become a shared service. Digital workplace is a good example as it often lies at the bottom of a CIO's priorities and it can't cut in line. The line of business will see it as just another tool. So a community of excellence provides a new model for getting it introduced. However this model often breaks for the same reason that other things break which is that it's not open to inclusion, eg vs open sources etc. When something is open, more people can participate. So instead, some organisations are introducing global solution networks to unite sometimes thousands of digital change agents achieve the same task through the network. This above shift also requires new management capabilities, including community and complexity management. And it provides a balance between a typical and uncontrolled approach to technology with the prevalence of shadow IT. 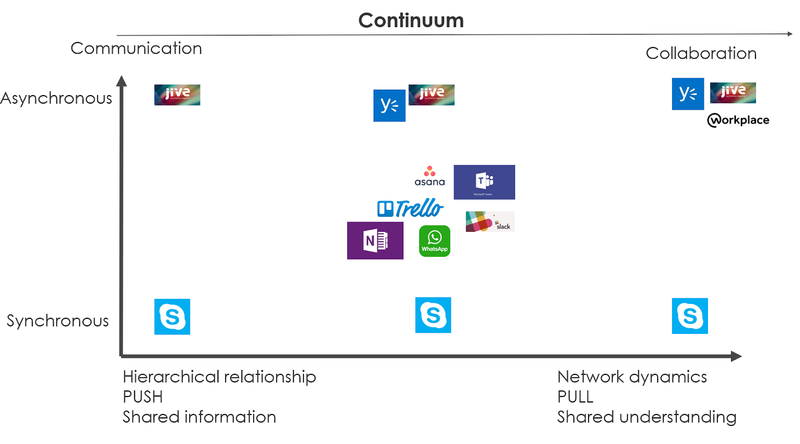 An optimal, dynamic design for digital workplace technology allows the business / employees to experiment openly and for the organisation's collaborative technology to compete with new and different systems, with everyone sharing in important discoveries. But all of this requires a better focus on what we're trying to accomplish - employee journey mapping does not have technology in it. 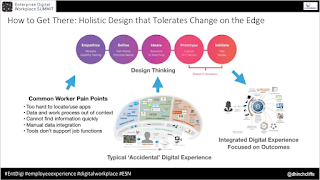 This is about developing the employee experience, using approaches like design thinking to understand common pain points, of late as well as early adopters, and develop an integrated digital experience based on outcomes. I think that's correct, though once again I think social outcomes rather than what I'd call business impacts should be a focus of digital workplace. In fact in my own session, I suggested that we should focus on organisational strategy / outcomes in preference to business strategy / impacts. I also suggest if we're really interested in developing empathic approaches to meeting employee needs and building a positive employee experience that actually the whole design process needs to start with the employee needs. Ie we should design our digital workplaces (as part of the broader organisation) based on these two equally important starting points - the organisation's desired outcomes, and the employees' needs as well. 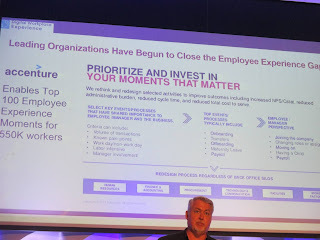 Eg our KPIs should matter to the business, and relate to capabilities employees want. 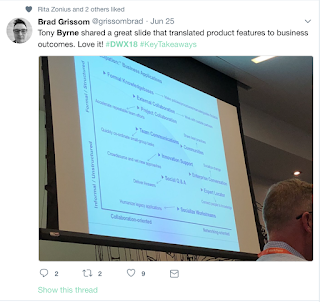 The above tweets were triggered by Dion Hinchcliffe's keynote this morning which I still want to post on. But I also think the issue they describe provides an interesting issue in its own right. I agree the technology isn't vitally important. The behaviour is. But the right technology will make it more likely you will get the right behaviour and a good level of adoption. And 'right' has to be about a relative fit for purpose in your own organisation, not just an absolute perspective on quality. There are two key inputs to this decision. The first is your organisation principles. The second is an understanding of what outcomes you want to achieve. And the third is your approach to do this, eg what type of behaviour you trying to encourage. This third question can be answered by identifying the right category of technology to fit your needs. And this requires some sort of categorisation of technologies. I liked this graphic from the Bank of England that also shows the complex technological environment in many firms. I've also been interested in Isabel De Clercq's emerging graphic on synchronous / asynchronous collaborative technologies. The comments on Isabel's article point to some of the difficulties in doing this, eg people consider S and A in different ways, and most tools can do some of both depending on how you use them. Collaboration is even more difficult - there are very different views about what we mean by this and alternative names for different types of communication. And also once again, there's a lot of overlap between them. However, I do think most models make the mistake of defining the territory from the perspective of the tools and what it can do rather than how people are going to use it. And if you want to provide people a home, you'll need a community system like Telligent, or at least one in which people find it very natural to form communities like Workplace by Facebook. You'll probably notice my definition of collaboration is different to Isabel's but aligns with eg the one provided by Mike Blair at Charles Taylor this afternoon: "Two or more people working on the same task to the same outcomes". I also talk about many of the above points in my book launch interview conducted with Workplace. And you can find out more in The Social Organization. The first keynote this morning at the Enterprise Digital Workplace Summit in London is from Jane McConnell who runs the annual Organisation in the Digital World survey and is on organisational principles for the 'gig mentality age'. "The gig mindset will be the real competitive advantage in the digital age"
Jane suggests eight key differences between the behaviours of these gig mentality workers and employees with a traditional mindset, including being goal oriented, flexible to work in different types of teams and work dynrmaics, creative, willing to challenge ideas and highly aware of the external world. 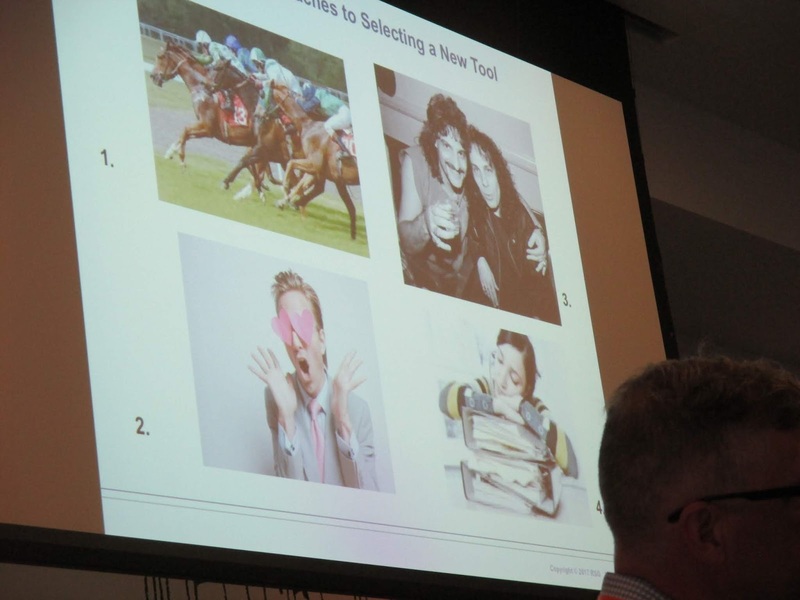 Organisations need to be more able to adapt because their people will be more adaptable, and also resilient in that they won't get taken down when a disruptive event takes place. They need to be able to learn and work out loud. Jane suggests this adaptability requires more focus on skills rather than roles, and that when you do this you fracture hierarchy - which is no bad thing. We also need to redefine leadership as influence rather than hierarchy. And pay more attention to teams, processes, openness, decision making and our vision for how works get done. I really like this early attempt at rethinking the principles we need in the new digital age and though they're still draft, prefer the direction that they're going to, eg those in Bruce Daisley's manifesto. 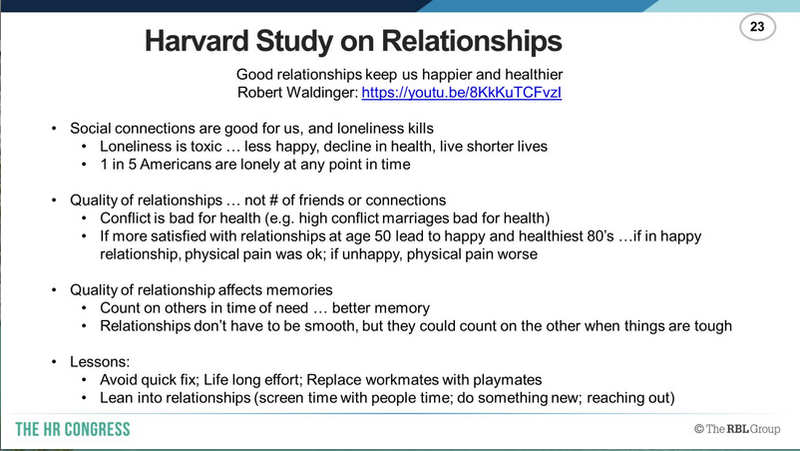 I also like the fact that they're reasonably succint, eg in contrast to Ray Dalio's TL;DR tome. There's also another good list from Esko Kilpi here. They real key though is developing a set of principles for your own organisation, making sure they are aligned with your own particular vision, and are clear enough that they'll influence your actions. I'll be returning to the theme of principles and organsiation design in my own Enterprise Digital keynote in November. 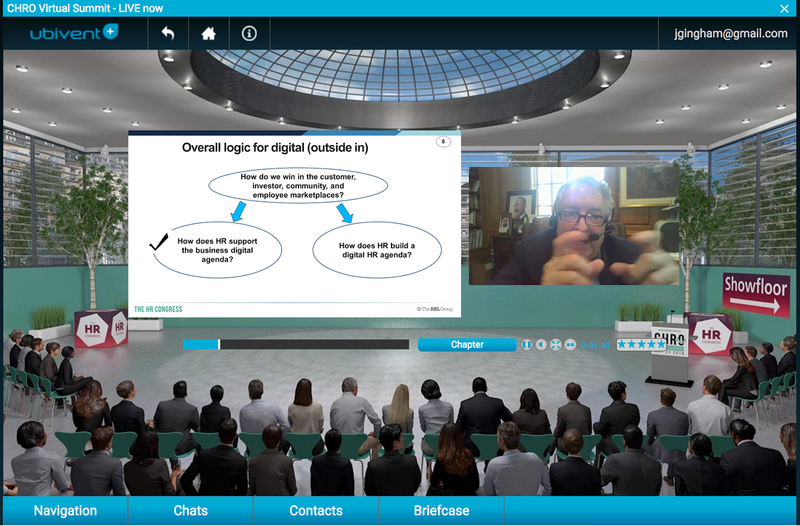 I was working on client and other things at home last week but did manage to catch the HR Congress' virtual CHRO summit. 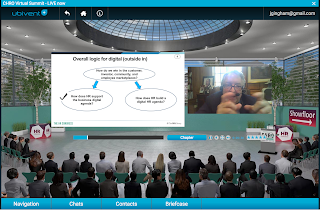 It's the first virtual conference I've been to for quite a while and whilst I found it as socially unsatisfying as last time I did one - which may just have been because I was working at home (but my suggestion: linked Twitter / Slack chat embedded in the system rather than text based chat page) I thought the content was really good. Given my current interests and project work I was particularly interested in Dave Ulrich's perspectives on digital. 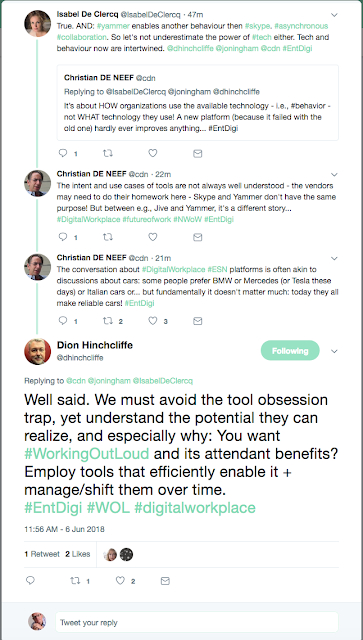 I also agree with his perspectives that it's useful to focus on both HR's support for digital business, and how digital changes HR itself (as above). On our support for digital business, I like Dave's focus on helping the business get its act together around its intent, plans and resources to become digital. Particularly as one of the major challenges any business faces in doing digital is managing the people changes associated with this (eg see this article from McKinsey). I do however think that there is more. Much more. 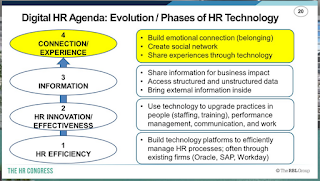 Changing the nature of the people employed (more contingent), the way they are organised (more networked), and the skills they possess (more digital) are all key tasks for HR to take on. 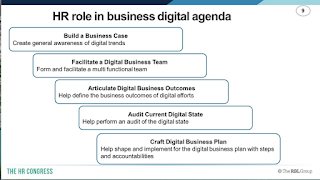 And which are all absolutely core, not just tangentially related, to digital business. You can find out more about my model in this post from 2015, or this one from 2011, or even my fist book from 2007 - published more than 10 year's ahead of Bersin's report (although my credibility as a futurist is rather tarnished by my rather bizarre claim from 2011 that social media wouldn't support any new business models - sorry Facebook!). The key thing in all these other models is that information isn't a stage, it's a complementary aspect of all three levels (efficiency, effectiveness and experience), linked to value for money, added value and created value in the value triangle. For example, The Social Organization I write about social and other digital technologies, the way they produce exhaust data and how this can be used to inform analytics and the generation os new insight. But it's generally not the main purpose for using the social / digital technologies. Given my current focus on The Social Organization, I'm also pleased to see connection and teams / networks at the top of both Dave's and Josh's models. 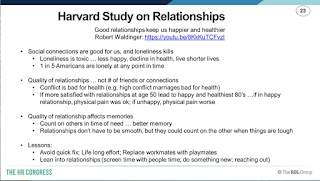 Dave noted that social isolation is the main cause of mortality and that if we want to be happy and healthy we need to ensure we have good relationships. All true. 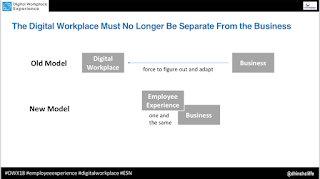 But the key point in terms of digital business is that once you've implemented digital, including robots, AI, contingent working, etc, the only remaining differentiator for your core workforce is their social relationships. 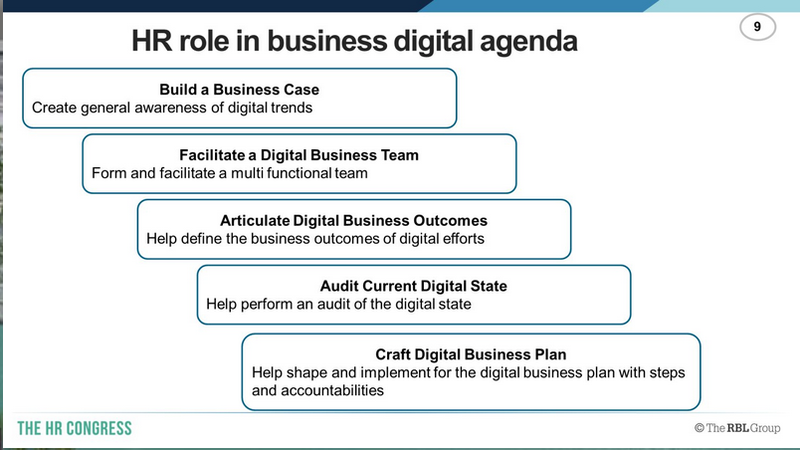 So it's not just a human / creating value thing to do, but a central requirement for digital business success. 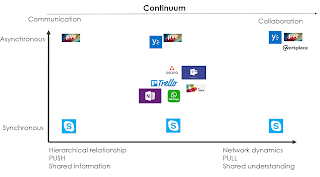 And why is suppose it's so critical for virtual learning platforms to take social connection seriously too. If you're interested in the proper HR Congress (which was a really social event last time I went) you may also be interested in these posts from that event in 2016.